Screenshot of the third “page” in Bumblebeelovesyou’s “The Story of How Things Came to Bee,” with one of the captions (which exist as “notes” on Flickr) displayed. Photo by Bumblebeelovesyou. 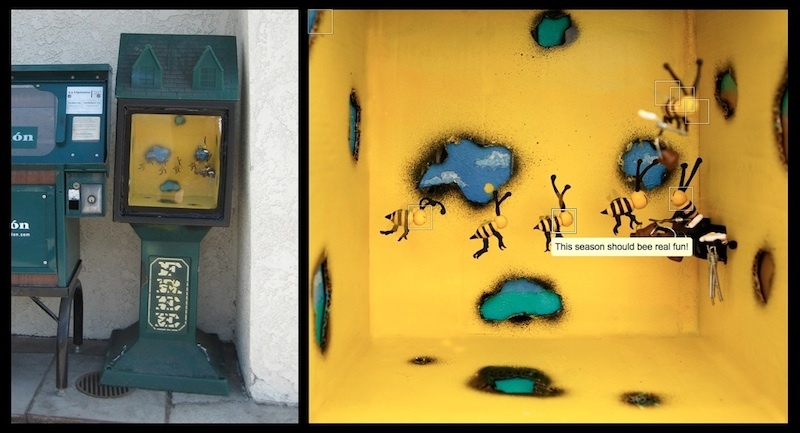 In 2009 and 2010, Bumblebeelovesyou installed diorama-like sculptures in newspaper bins around Los Angeles. On their own and on the street, these sculptures are interesting. They are cute little scenes. But the work really comes alive online. Each diorama is actually a frame in a photo-based web comic by Bumblebeelovesyou called The Story of How Things Came to Bee. After installing the works in a public place, Bumblebeelovesyou photographed them and uploaded the photos to Flickr. So far, pretty standard. I suppose it wasn’t even all that crazy that the works should form a cohesive story that could be read online by viewing one photo after another. Certainly that alone would be an interesting use of the internet facilitating something that would be difficult to do in real life (and the next section features something similar), but Bumblebeelovesyou took things a step further. By using Flickr’s note feature, which allows users to tag specific parts of a photo with text boxes that pop up when you scroll over the right parts of a photo, Bumblebeelovesyou was able to add in captions to each photo/frame so that The Story of How Things Came to Bee could include dialog rather than just images. That dialog can only be read when you view the frames of the story on Bumblebeelovesyou’s Flickr, so the only way to really get the full experience of the work is to go online. This piece is similar to the “Activated on your screen,” piece, but goes one step further because while those pieces can still be viewed in their entirety on the street, even if that is out of context. Unfortunately, only 10 frames of The Story of How Things Came to Bee were posted before Bumblebeelovesyou seemingly abandoned the project, but the idea is an interesting one in the way it combines the physical with the digital to creative a single cohesive work.